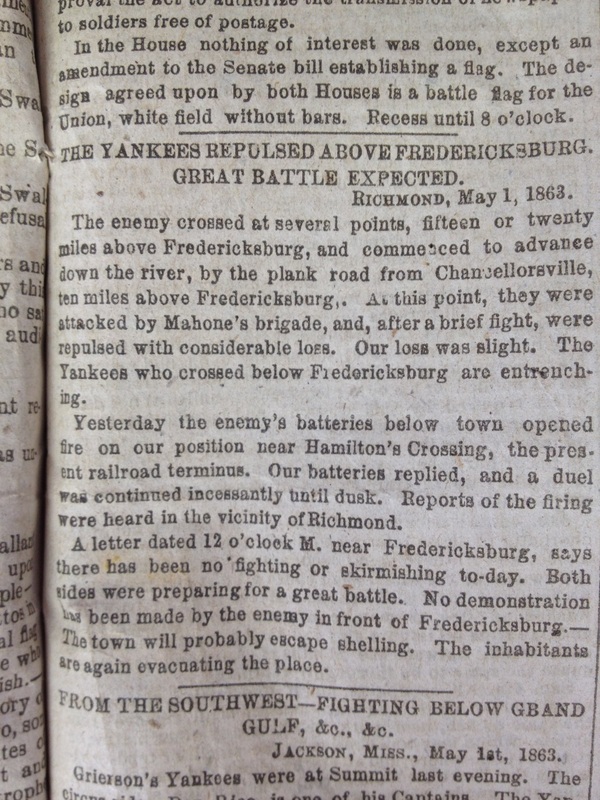 Item Description: Article from the Wilmington Daily Journal, announcing an expected battle near Fredericksburg and Chancellorsville. Item citation: Wilmington Daily Journal, 2 May 1863, page 3, column 1. From Miscellaneous Newspapers in the North Carolina Collection, Wilson Library, University of North Carolina at Chapel Hill. The enemy crossed at several points, fifteen or twenty miles above Fredericksburg, and commenced to advance down the river, by the plank road from Chancellorsville, ten miles above Fredericksburg. At this point, they were attacked by Mahone’s brigade, and, after a brief fight, were repulsed with considerable loss. Our loss was slight. The Yankees who crossed below Fredericksburg are entrenching. Yesterday, the enemy’s batteries below town opened fire on our position near Hamilton’s Crossing, the present railroad terminus. Our batteries replied, and a duel was continued incessantly until dusk. Reports of the firing were heard in the vicinity of Richmond. A letter dated 12 o’clock M. near Fredericksburg, says there has been no fighting or skirmishing to-day. Both sides were preparing for a great battle. No demonstration has been made by the enemy in front of Fredericksburg. The town will probably escape shelling. The inhabitants are again evacuating the place. More about this item: This announcement was printed by a Richmond newspaper on May 1st, 1863, then telegraphed to the Wilmington Daily Journal, which printed it the following day. This entry was posted in Southern Historical Collection and tagged Battle of Chancellorsville, Fredericksburg, Wilmington (N.C.) Daily Journal. Bookmark the permalink.